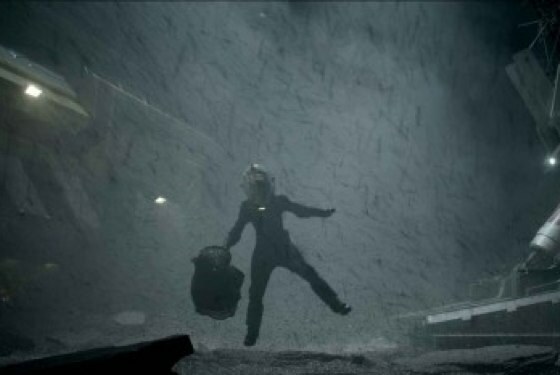 Until today, little was known about Ridley Scott’s next film Prometheus, and even the main detail was one that Scott has intentionally muddled: It’s a prequel to Alien … but not really. Today at Comic-Con, though, Scott, screenwriter Damon Lindelof, and stars Charlize Theron and Noomi Rapace lifted the lid on Scott’s sci-fi thriller and showed off the first footage ever. Less a teaser trailer than a behind-the-scenes look with stray shots from the movie, the Prometheus clip showed actors like Theron, Michael Fassbender, and Idris Elba navigating huge alien caves in their retro-cool spacesuits topped off with giant bubble heads. With little plot to be sussed out from the footage – the crew finds some elongated vase-eggs that look less like the ones from Alien and more like something that just came off a potter’s wheel – the look of the film was what impressed us most. Black and white with pops of clean, bold color, Scott breaks up the white of Fassbender’s spacesuit by placing an orange basketball in his hands, and cuts through the dark interior of the spaceship with the fluorescence of a yellow-visored helmet or a blue flashlight beam. “I certainly hope so,” added Lindelof. “So do I. So does Fox,” Scott said.